Can we identify the mental strength skills we need to run our own business? All around us we hear about mental health, we are in an age when the need to support our mind as well as our body has become the ‘thing’. This is a really positive step forward. I guess mental awareness is the benefit, self awareness and knowing we don’t have to remain isolated in our minds when we are low, anxious, unhappy, we can reach out. My focus is on the mental strengths we need. If my immune system is low or my body seems weak, I seek to strengthen it. Therefore, surely if my mental well being is a parallel to this , I must seek ways to strengthen my mind. Being in business like we all are, takes a great deal of mental well-being and strength, I celebrate that everyday when I witness the triumphs over adversity in all the business owners I spend time with. Today, I would like to identify 10 words that we all feel are the attributes we need to have a healthy outlook and the ability to mentally manage owning a business. 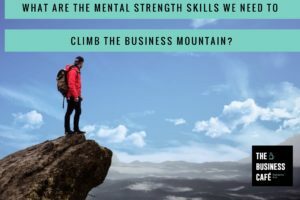 I am speaking to a Psychologist at the moment who writes Psychometric Tests to see if we could create a ‘test’ that start-ups and existing business owners could take to measure their personal mental strength for business. This is very much early thinking, but I like the idea of an App that we provide for free, that highlights the Mental Skills we all need and perhaps identifies areas we could as an individual we could perhaps strengthen or at least be more aware of. With this App, members could then seek the type of ‘coach’, reading material or inner awareness to build the Mindset and Strength to sustain and enjoy their business even more.